Jaw-dropping beast of a drone! Numerous security features, an independent FPV camera and extensive flight modes feature the second generation of the DJI Inspire. 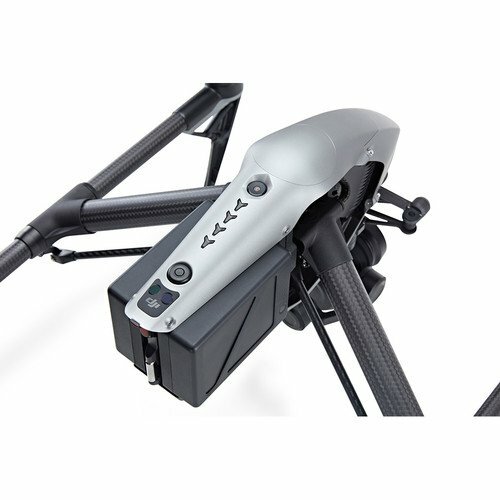 In combination with the more favorable X4S camera Inspire 2 is an UAV ideal for aerial photographer with high demands. In November 2016 DJI presented its latest flagship. The DJI Inspire 2 (internal T650) is the latest generation with numerous features and improvements – as a significantly expanded anti-collision system, a biaxially stabilized FPV camera, a built-in image processor and several new flight modes. The price of Quadrocopter: at least 3500$ (without main camera). For the most part, the design of the new DJI beast is unchanged and is similar in large part to its predecessor. Extremely high-quality materials and an extensive equipment consisting of propellers, batteries, charger, remote control, accessories, desktop charger or transport case are of course also in the second generation Inspire. You only need a smartphone – or the new DJI CrystalSky monitor with installed DJI GO app – to fly the DJI Inspire 2. 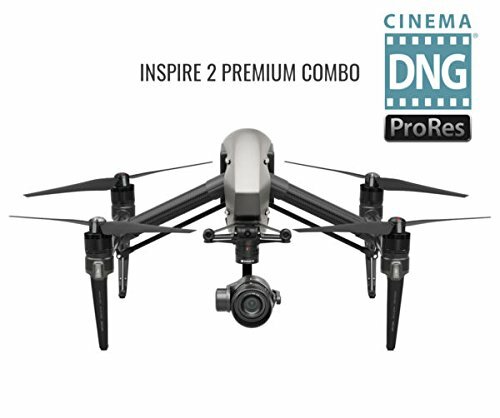 The Inspire 2 looks much like its predecessor. When examined in detail, you can spot smaller design changes and technical innovations. Worth mentioning are not only camera and new body, but also the dual battery bay. A meticulous comparison to the previous generation reveals a new copper-colored housing made of magnesium aluminum composite material. Besides high-quality case, the 42.7 centimeters long, 31.7 centimeters high and 42.5 centimeters wide, the 2-nd version of DJI Inspire series, like its predecessor, has a quality carbon boom and the typical lift mechanism, which is in some way reminiscent of a bat. 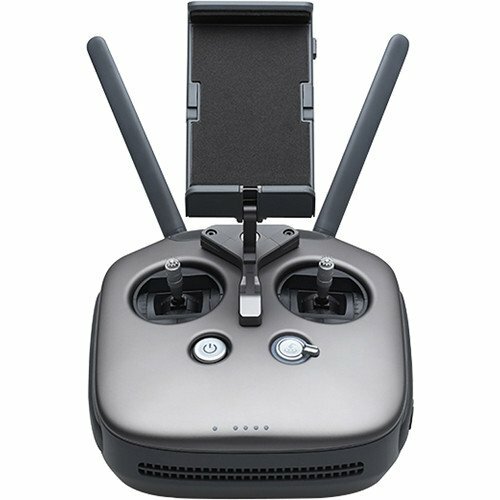 Want to know best cheap drone? Or see how good is the Syma X11? What do you think how much money do the most expensive drones cost? Or what is a headless mode on drone? What is a difference between drone and quadcopter? Do you know what the best fpv drone is? Which one is better – Phantom 4 and Mavic Pro? Is Latrax Alias better than MJX x600? 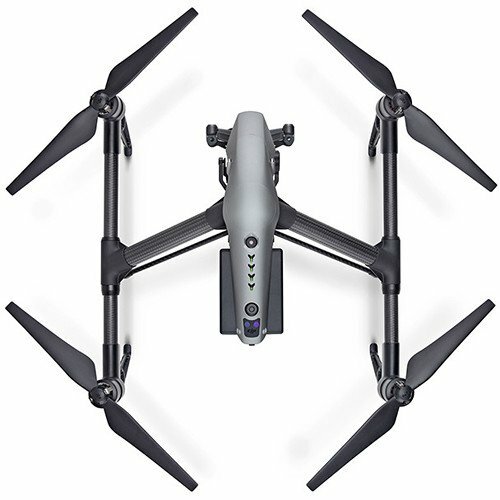 Particularly striking is the dual battery slot, which allows the use of two energy storage devices at the same time and a flight time of up to 27 minutes, which helps (especially when using with DJI X4S camera). Aside of that, the use of a dual energy system is an enormous increase in safety: If one TB50 Battery – available for a whopping 200$ – drains out during the flight, the second battery provides enough energy for a safe landing in the Return To Home mode. With the 180 watt charger and the supplied multi charging station, Inspire 2 needs approximately 90 minutes to load two batteries. If you charge four batteries with the intelligent multi charger, the charging process takes around 180 minutes. Premounted, powerful 3512 engines and supplied propellers are characteristics of the DJI Inspire 2. DJI offers optional heights propeller that are designed to provide a consistent performance at altitudes of more than 2,500 to 5,000 meters. A remote control with the usual control sticks and buttons and switches as well as integrated, 6,000 mAh strong 2S battery is also included. Good to know: The remote control of the DJI Inspire 1 is not compatible with the Inspire 2. Otherwise, the powerful 3512 engines and the new 1550T-propeller are worth mentioning, which are of course preassembled and included in the basic equipment. For flights on heights of more than 2,500 meters DJI offers special heights propeller, in particular to ensure a good flight performance in thinner air. DJI Remote Control has also been revised and now has an improved transmission or DJI Lightbridge system with dual band technology. This means that transmission ranges of up to seven kilometers are possible – both in terms of control and image signals. FPV-image and the camera image is transmitted, depending on the distance in 720p or up to 1080p resolution. The quick release mechanism of the DJI Inspire 2 allows quick assembly and disassembly of the propeller. 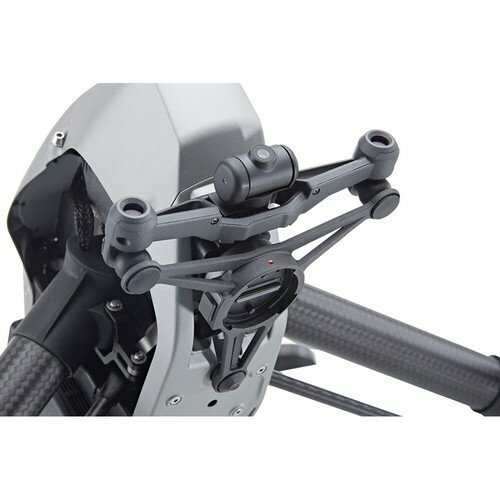 DJI offers optional heights propeller for the DJI Inspire 2 in-house range of accessories.Carbon propellers are not yet available. DJI Inspire 2 now uses two batteries. These simultaneously provide the Quadrocopter with the necessary power. 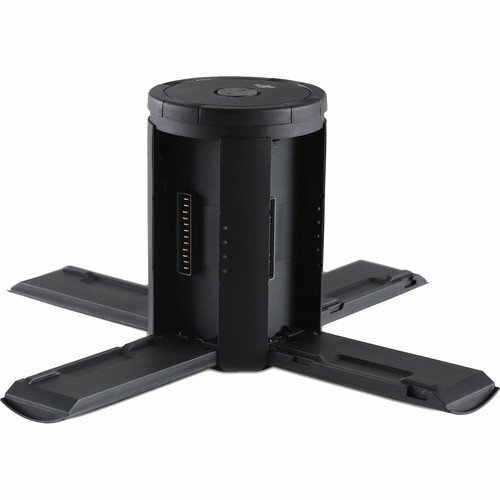 Good to know: If one battery fails, the DJI Inspire 2 can be landed safely thanks to the second energy storage. 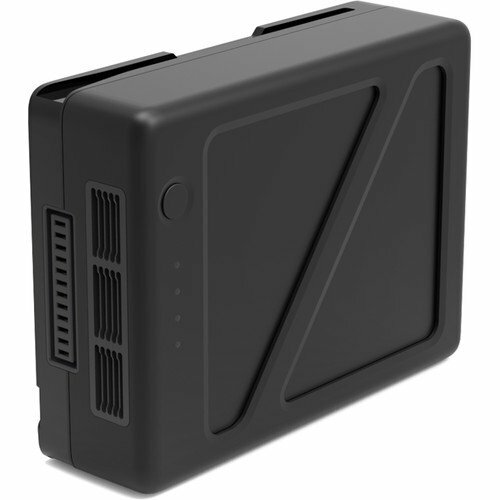 As with the DJI Inspire 1, Inspired 2 uses a tablet or smartphone as a central control unit. Alternative to the mobile devices is a DJI Crystalsky monitor that can be used as control station with installed DJI GO App. The other technical data and options are at a very high level. The transmission range of camera and control signals of the DJI Inspire 2 reaches about seven kilometers and is at the level of DJI Mavic Pro that uses DJI OcuSync system. The Live View image is now transmitted in 1080p resolution. The speed is 30 meters per second – meaning 108km/h – extreme power. (although, the maximum speed of the DJI Inspire 2 is limited to 94 km / h). Whether X4S or X5S version: The DJI Inspire 2 is ideal fit for professional aerial photography due to high-quality solutions in the field camera and gimbal . The new Inspire features a new CineCore 2.0 image processor directly in the front end of the drone, and an integrated CINESSD system. Therefore it is capable of filming high-quality material 5.2k (30fps) in CinemaDNG format or Apple ProRes material. Optionally, you can choose the DJI Inspire 2 with a X4S camera or a X5S camera. The cameras are not included in the basic package and must be bought as an additional equipment. No matter which camera you choose, this quadcopter is an absolute delight for professional aerial photographers and cinematographers which you will see later on in this DJI Inspire 2 review. The favorable X4S variant has a 1-inch image sensor – similar to the DJI Phantom 4 Pro – and allows you to take 20 Megapixel photos. Want to know best DJI Phantom 3 alternatives? Thanks to the larger sensor – and an ISO range of up to 12,800 – Inspire 2 makes stunning aerial images even in poor lighting conditions. With 84 ° the X4S camera offers a very natural field of vision. Also noteworthy is the improved 11.6 f-stops dynamic range of Sony Exmor R CMOS sensor and 14 DNG or JPEG images per second, which can be made with the X4S camera in Burst or Continuous mode. The Adobe CinemaDNG- and Apple ProRes format is available only with the more expensive X5S variant. The DJI Inspire 2 now has a second camera. This camera is suitable only for the FPV flight and not for the recording of high quality aerial photographs. One widely known problem – namely the lack of FPV Camera for Inspire 1 – is now solved. The Quadrocopter now has a second front camera stabilized in two axles with a resolution of 640 x 480 pixels, which is mainly responsible for the transmission of the FPV-image. Within the DJI GO app you can switch between the view of the FPV camera and the view of the aerial camera with just one click. The pitch axis of the FPV camera can be adjusted by pressing the C2-button and the left scroll wheel on the remote control. The roll axis is not adjustable. The Inspire 2 has numerous security sensors in combination as anti-collision systemact and not only ensure safe flight conditions, but also for appropriate evasive action. The new Inspire 2 has forward and downward facing ultrasonic sensors , the obstacles in up to 30 meters can detect at airspeeds of up to 54 kilometers per hour. New are infrared sensors above the Quadrocopter that can detect obstacles in up to five meters, and thus in particular within buildings for appropriate security worry. The obstacle sensors are active during normal flight modes, the RTH-flight modes as well as in all intelligent flight modes. In addition, the new generation of Inspire drones now provides a redundant IMU unit and redundant Barometer. 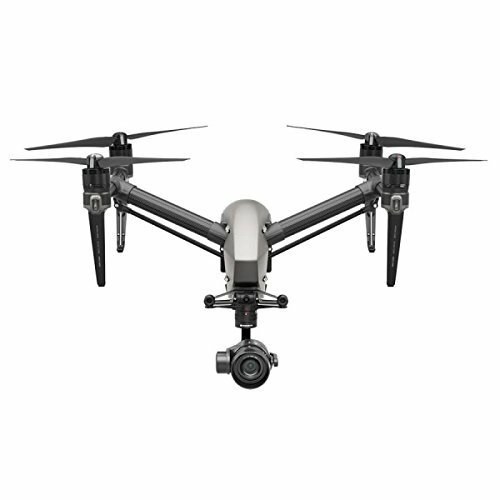 Here, the DJI Inspire 2 provides a significant safety advantage in comparison to the Inspire 1 . With Spotlight Pro, DJI introduced a new tracking mode, which allows pilot to produce dramatic and complex aerial photographs in single mode. In Spotlight Pro aerial camera remains fixed to the selected object, while the flight to the DJI Inspire 2 can be arbitrarily selected. The flight mode has two additional recording modes – the so-called Quick-mode and the so-called Composition mode. A new feature is also the Quick Spin 360 degree option. This can be triggered manually or operated in automatic mode. If you turn the camera too long in the same direction, Inspire will recognize it and when reaching approximately 270 ° angle of rotation, it will continue to go in the same direction and quickly do a whole circle around its own axis. If this happens during a maneuver, the maneuver and the control direction is not affected by the rotation itself. When compared to the DJI Inspire 1, the seconde generation of DJI Inspire has numerous features and technologies to offer. What is really huge jump is the variant camera (X4S) – due 1 inch large image sensor, it has a much better position. The dual battery bay and the numerous anti-collision sensors, flight modes or redundant units (eg redundant IMU) make the DJI Inspire 2 a significantly safer UAV. But the new FPV camera or the optional DJI Crystalsky display should also be mentioned as big advantages of latest DJI UAV. Overall, the DJI Inspire 2 is not only safer, but also more comfortable and technologically advanced than its predecessor model.